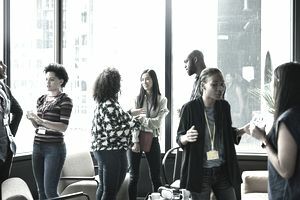 Networking is vitally important for your career because it can open the door to exciting possibilities like meeting influential people, a future mentor or new opportunities. It can also be both personally and professionally enriching. So why do some of us avoid building our network through networking events? Maybe it’s the fear of the unknown or the thought of it makes us feel uneasy. To help you overcome these emotions let’s cover the things that are within your control now so that you can feel more in control later on. Two sites that work well are meetup.com and eventbrite.com. Within each site search for categories that interest you then select a network type of event. Another option is to ask your friends and co-workers about networking events they have attended. Then ask if they want to join you for your next networking event. You could also check out associations that your LinkedIn network belongs to and see if they offer networking events or conferences. If an association really interests you join it and then be sure to subscribe for their newsletter to stay up-to-date on upcoming events. Next, check your calendar and plan out a few events. You could aim for one event per business quarter to start. Also, pre-registration is a good idea because you will be less likely to bail if you’ve already registered. This gives you time to prepare and makes planning less stressful. Are there a number of contacts you want to hit? What will your “ask” be? Is there a problem you’re looking to solve? Are you looking for a new hire? Is there a type of person you want to meet? Having a goal to achieve will keep your focus and keep the nervousness at bay. Next, research what each event is about. If there is a presentation research the presenter and think of questions you’d like to ask them. Another tip is if the event will be held at a historical landmark, read up on it (great conversation starter!). Prepare a rough outline about what professional and/or personal information you will share with new contacts. Will you share that you are a working mom? Will you share how you integrate your career into your life? Be prepared to answer questions like “So, what do you do?”, “Why did you choose to attend this event?”, or the infamous, “How do you do it all?” Having this outline will help you keep the conversation going without babbling on or to help avoid those awkward moments of silence. Plan the outfit that you will wear. If it’s after work, bring a new outfit with you so you feel fresh and special. Try wearing an accessory that you find interesting and would enjoy talking about. If this advice isn’t your thing, look for people who have worn something sparkly or dazzling then ask them about it. Be prepared to listen to their story. Before the event takes place find some time to relax. Find a mirror and check that everything is in place. Then take a few slow deep breaths. You are not going into a competition. No one knows about the goals you’ve set or the ask that you’re bringing to the event. Only you will know if you succeed or not. Lastly, remember to smile. You have worked hard to get to this point and should be proud of what you’ve already accomplished! Believe that you are someone worth meeting because you are!